Depart Nairobi in the morning and drive southwards to the viewpoint of the Rift Valley. Stop briefly to view the escarpment and proceed to Narok for lunch. You arrive in Mara late afternoon for an evening game drive. Dinner and overnight at the campsite. 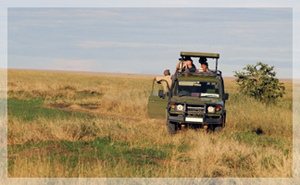 After breakfast proceed for a full day of game viewing at the Masai Mara Reserve. Picnic lunch at the Hippo Pool. Dinner and overnight at the campsite. Morning game drive. You will be free in the afternoon when you can go for an optional nature walk. After breakfast depart for Nairobi arriving late afternoon. Depart Nairobi in the morning and drive to the Great Rift Valley viewing sceneries on route. Lake Nakuru, “the pink lake”, awaits with its large numbers of flamingos, both lesser and greater species and other birdlife. This is the best place to chance seeing the elusive leopard, and black and white rhinos. 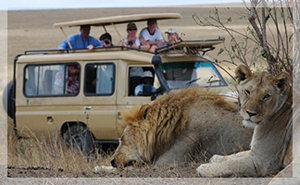 Morning game drive, Watch and photograph Birds and Animals, breakfast and depart for Masai Mara, Arrive in time for lunch. Afternoon game drive is taken. Dinner and overnight at campsite. Full day in Masai Mara. Morning game drive. Afternoon you are free to go for an optional nature walk or a visit to the Masai Manyatta, or take it easy at the campsite meeting other travellers. Pre-breakfast game drive. Return to campsite for breakfast. After breakfast break up the camp and depart for Nairobi arriving late in the afternoon.